A kettle whistles and I remember how my family gathered around the kitchen table for tea time. After dinner my mom and dad sat with us and we’d chat over the tea pot. My parents didn’t plan tea time as “quality time,” but that’s what it was. Tea time was our time to put away distractions and focus on each other. Sometimes our tea time would last hours. Tea was more than just a beverage, it was part of our family traditions brought over from Ireland to New York. I’m told my mother used to give us tea in our baby bottles. Even though many years have passed, tea is closely associated with family, love and comfort in our homes today. My siblings and I spent Sunday afternoons around my parent’s kitchen table after we had all grown and started families of our own. As each of us arrived Dad would jump up and put the kettle on. We’d stir up a cup and time would fly as we listened to embellished family stories that we’d heard time and time again and laughed. Good times and bad times, we shared them all over a cup of tea. When we lost mom, we had tea with dad. When dad had his stroke we sat with him like it was the old times. Even though he had trouble understanding and speaking he enjoyed the company and the bonds we strengthened around that table. I write about senior safety and senior care nowadays. 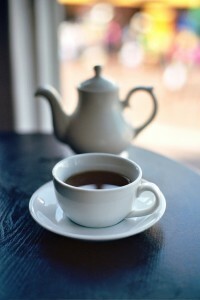 There’s plenty of research on the potential health benefits of all sorts of teas. Some research shows green tea can lower blood pressure and even reduce the risk of depression in the elderly. But tea is more than a healthy beverage. Tea time gives us a way to connect with our loved ones. If you care for an elderly loved one I’m sure you worry about their prescription medications, physical activity and safety – but one of the most powerful things you can do to keep that senior healthy and happy is to spend time with them on a regular basis. We’re social beings and we crave contact with other people. Even the most cantankerous senior needs time with others. The elderly need time to be listened to and time to feel remembered and valued. Make a daily or weekly date to share a cup of tea with an elderly friend or relative. Brian McGovern is a senior health writer at ElderKind.com and his favorite tea is Orange Pekoe with a touch of milk. We’re social beings and we crave contact with other people. Even the most cantankerous senior needs time with others. The elderly need time to be listened to and time to feel remembered and valued. Make a daily or weekly date to share a cup of tea with an elderly friend or relative. Brian McGovern is a senior health writer at ElderKind (http://elderkind.com) and his favorite tea is Orange Pekoe with a touch of milk.